Late November 1941, scant weeks prior to the Pearl Harbor attack, finds a team of incognito German Luftwaffe aircrew personnel, in company of an SS Special Operations unit, assuming residence in a remote autonomous region of Western Panama, less than two-hundred air-miles from the Canal Zone. Their purpose: Preparation for a clandestine mission which, if successfully executed, could indefinitely disrupt the passage of Allied maritime traffic through the inland waterway in the event of war with the United States. But the enemy ploy has not gone undetected, and a solitary British SIS (Secret Intelligence Service) operative succeeds in alerting the Americans, through his Jamaica-based controllers, shortly before he is waylaid by locally-implanted Gestapo agents. Though fully aware of the potential menace posed by a regional Nazi presence long-since established in neutral neighboring territories, United States military authorities, now provided with definitive proof of impending hostile actions, are confronted with the sensitive problem of protecting the Canal without employing armed force within a sovereign country — a response which could appear as overt aggression on part of the U.S., thereby creating a diplomatic debacle in Latin America. Further complicating this already perilous situation are the uncertain involvements and intentions of Panamanian officials, some of whom are known to be not only resentful of the “Yanqui Imperialistas” but decidedly pro-Axis in their political alignment. Confounded by an effective means of discreetly neutralizing this looming threat, the Office of the Coordinator of Information — a fledgling American intelligence agency created under auspices of the Franklin Roosevelt White House — resorts to subterfuge and recruits, through close partnership with SIS, the services of individuals with whom there exists no official connections to U.S. interests, their realm of operation extending well beyond the confines of orthodox military or political establishment. Leander Jamieson Gowrie, disgraced ex-officer of the Black Watch, deadly when sober. Participant in the Spanish Civil War prior to his desertion from the International Brigades, erstwhile soldier-of-fortune in the employ of Chinese warlords, Gowrie currently operates as a hired gun for SIS in the Western Hemisphere, and is furnished to the Americans with a one-way ticket to Panama. Charley “Doc” Irvine, free-lance American aviator. Former aerial duelist in the South China skies, arms smuggler to Haile Selassie’s beleaguered Abyssinian troops, and, later, RAF Fighter Command Volunteer Pilot during the Battle of Britain, Irvine presently supplements the income from his Central American air transport business with U.S. and British currency paid in exchange for clandestine courier and reconnaissance flights, this latest run for which he is contracted likely to prove his last. Nigel Merriweather, late of the Indian Army and Shanghai Police Department. Scourge of bandits, dacoits, and Malay pirates, killer of over three-hundred Japanese military personnel while serving with Nationalist Chinese guerrillas, Merriweather has recently raised and trained his own private army — comprised of Jamaican poachers — for the task of raiding a secret German U-Boat submarine refueling base located on a neutral Caribbean island, yet this main focus is soon to be redirected, with both Irregular and new assignment ultimately disavowed by his controllers. Betrayed one and all by their employers even before the search-and-destroy counterplot is set into motion, the lethal survival skills of the “gifted, expendable amateurs,” as one Allied intelligence director describes them, will, nonetheless, greatly impress not only their arrogant overseers, but especially those residents of the Nazi enclaves situated within the Panamanian interior. 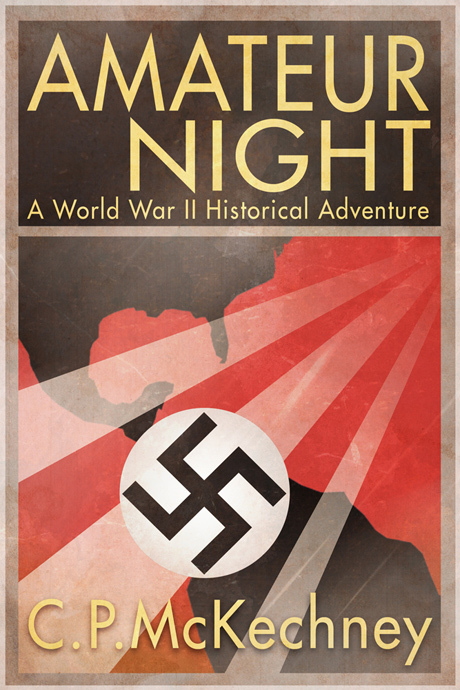 Inspired by first-hand accounts, as well as documented fact, Amateur Night explores a little-known aspect of clandestine activities carried out during the early phases of World War Two. But for the astute reader, this story should be considered as strictly a work of historic fiction… or should it? A resident of south-eastern Pennsylvania, C.P. McKechney can claim descent from a long line of Scots mercenaries, highwaymen, horse-thieves, pirates, and smugglers, with a few English political radicals and Irish brigands thrown in for good measure, some of these antecedents the holders of noble title within their own respective lands. The graduate of an accredited northeastern American college, the author has maintained a somewhat unorthodox professional career encompassing a wide variety of occupations, even if a keen interest in fiction writing has been preeminent throughout those academic and employment endeavors. But it has proven largely the result of his avocation as a long-term history and aviation enthusiast (in addition to associations with various nameless individuals) that certain factual treasure-troves have periodically surfaced alluding to obscure enemy clandestine operations intended for implementation in the Western Hemisphere during World War Two, that information thus derived providing basis for the creation of his original literary material.